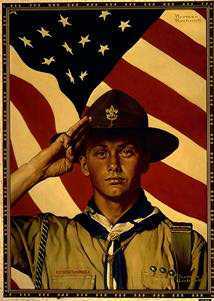 The old US Scouting Service Project Clipart library was replaced with this new and easier to use version on March 30, 2002. Many new images have been added. The directory structure has been simplified and flattened. Images have been cleaned up. Multiple images have been eliminated -- only GIF images, and some JPEG images where applicable, are included in the new library, and only the largest, cleanest versions. Browse through the list below and select a gallery. You can download individual images to your computer by mouse-clicking on any image in the gallery or on the title. Once the image has been downloaded to your computer you can import it into your word processor document or html file, and scale it as necessary. Baden-Powell_Memorabilia Plates, cups, etc. When Baden-Powell returned from the Boer Wars and the Defence of Mafeking, he was hailed by the British people as a war hero -- thus the plates with his likeness. For a good read, pick up "Robert Baden-Powell: Two Lives of a Hero" by William Hillcourt. Baden-Powell_More_Sketches Baden-Powell was a prolific artist and illustrated all the many books he wrote. BSA_Council_Shoulder_Patches A whole bunch of BSA Council Shoulder Patches, old and new. Cub Scout inisnia for each program, including Tigers and Webelos. Also Cub Scout activities and images from Cub Scout Roundtable. BSA_History A wide variety of BSA Anniversary emblems, book covers and other old memorabilia. BSA_Inspirational A few inspirational images, including Greenbar Bil Hillcourt. BSA_National_Eagle_Scout_Assoc A variety of NESA images. Jamboree_on_the_Air Patches and other images from past worldwide Amateur Radio JOTA events. JOTA is a Ham radio event specially for boys and girls in youth groups. The youth are invited to talk with other youth around the world by means of Ham Radio stations. Scouts_at_the_Worlds_Fair Some emblems from past Worlds Fairs involving Scouts. We have tried our best to avoid infringing on anyone's copyrighted images. We have obtained permission to reproduce here certain copyrighted images, for the express use of Scouting and youth groups to use to further their programs.